CONDO DE LUXE DE 2 À 3 CHAMBRES À 50 MÈTRES DE LA PLAGE !!!!! Condos de luxe de 2 ou 3 chambres à coucher sur la plage. Grande piscine, restaurant et bar. Vous voulez des vacances de rêve? Ceci est l'endroit! Avec 2100 ou 2700 pieds carrés de sols en marbre travertin, ces condos meublés sur mesure offrent confort et luxe. Vous dormirez comme un bébé sur la peluche, oreiller Restonic matelas avec des draps en coton égyptien. Profitez de tous les conforts de la maison dans cette cuisine mis à jour avec des appareils en acier inoxydable, armoires en érable massif, et des comptoirs en granit. Détendez-vous sur le canapé et regarder la 'TV écran plat 42 ou s'asseoir dans la chaise chaise longue sur la terrasse et regarder le coucher de soleil sur l'océan. Marcher 20 étapes de votre patio arrière et plongez dans la piscine avec température régulée ou à glisser dans l'un des 5 bains à remous situés à côté de la plage. Commander une boisson à partir des employés de la piscine ou faire quesadillas au café de la piscine. Faites une sieste dans un hamac, sentir le vent frais et en écoutant les sons des vagues. Partez pour une promenade sur la plage de la petite ville mexicaine de Bucerias ou prendre un taxi à Puerto Vallarta pour le shopping. Aller au spa pour les traitements de l'eau et sauna, puis endulge un massage aux pierres chaudes relaxant. Le service d'étage pour votre dîner ou avoir le chef vient à votre condo et de préparer un repas gastronomique. Allez au lit et se reposer confortablement, puis se réveiller à un autre jour dans le paradis! Amazing unit on a fantastic property! Booked a last minute trip and I was a little apprehensive about our rushed plans but am familiar with the Villa la Estancia property as there is one in Cabo that we have enjoyed on several trips. Tom was very responsive and helpful, and while no unit number was specified I decided to roll the dice and hope for the best. We ended up in one of the loveliest units we have ever enjoyed with a great ocean view on the 7th floor. Check in and out was very easy and the property is very well run and quiet. Great pool area and staff and while we are able to enjoy the restaurants and activities of Villa Palmar next door I like the slightly more upscale and quieter La Estancia pool area. The unit was in great condition and spotless upon our arrival. We loved drinking coffee on the large patio and bought groceries at the nearby Mega, which made breakfast and snacks with our kids much easier. Beach was great, clean and swimmable, and while there are vendors they have to keep at a distance in our roped off sitting area. The girls enjoyed fresh mangos on the beach cut into flower shapes and we dined often in Bucerias, the little town five minutes away via taxi. We had a short but superior stay and rented the full 3 bedroom villa at Villa Estancia. We personally really like being on the ground floor due to the easy access and since I was hosting a birthday event it was nice always be close to the pool and beach. The beds were super comfy and pillows were cozy. Housekeeping is not provided with this type of property which I was at first disappointed about because love the turndown service and overall a cleanup but it was completely fine and there were loads of towels in the room. Melba was responsive and easy to communicate with which was much appreciated. I have no complaints about the room, the quality, the cleanliness, location and amenities. Villa Estancia is very quiet though at night and shuts the bar and bar food down very early, so prepare yourself for that if you like to be at the swim up bar past 6. However, you can go next door to the sister resort or to Bucerias down the road nearby for some action. We loved sitting on the beach at sunset so we shopped for our own snacks at the market to have during that period. Wonderful vacation overall. We thoroughly enjoyed our stay at Villa Estancia and loved this 3 bedroom villa. We were here with friends (adults) for a 50th birthday celebration and chose to rent villas to share with friends vs all separate rooms. 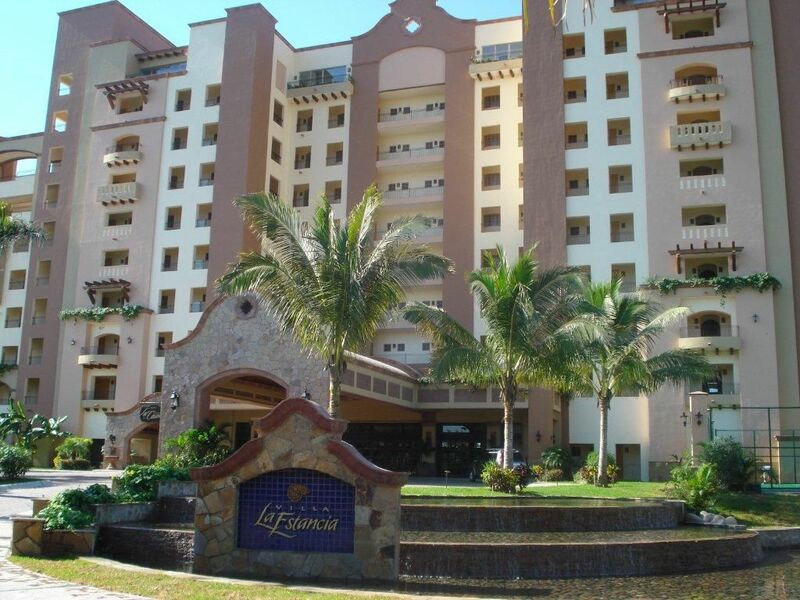 The ground floor location is very convenient and steps from the pool and walkway to the lobby or beach. It is set back enough to have privacy. The decor in the room was very unique and the beds were super comfortable. Note that in timeshared housekeeping is something you will need to book on your own at an extra charge but you will find lots of towels and linens in the rooms. At first I was disappointed to realize this but it was no issue at all and I hardly noticed (we opted not to have the service). Overall, I highly recommend Melba and her lovely villa and we hope to return. This resort is quite special. You are treated to the best of resort amenities and the comfort of a spacious condo. The resort pool and restaurants are lovely. Try the restaurants in Bucerías. They are fabulous. The Mega Store for groceries is a short drive away. We have vacationed in both Melba’s two and three bedroom condominium. We loved them both. The kitchens are fully stocked. The furniture is upgraded. The mattresses are terrific. We especially love the first floor location. The owner, Melba, is very responsive and helpful. Our favorite vacation ever! Overall, this trip was a 11 out of 10! Villa La Estancia is a first class resort about 20 miles north of Puerto Vallarta in Nuevo Vallarta. The resort is right on the water, so you can pool it or beach it or both. The resort grounds are beautifully maintained and come with a large work out room and top notch spa. The pool is wonderfully maintained with plenty of cushioned chairs and umbrellas for everyone in your party. There is a swim up bar and the food/ pool service is outstanding. We stayed in a 3 bedroom unit that comes with a two king suites, one double queen suite and a living room/kitchen area....all with a deck that overlooks the ocean. Just doesn't get any better than this. The resort is within walking distance (or short cab ride) of the beautiful town of Bucerias that sports first class dining and shopping. Too many wonderful places to even mention here. And the world renowned "city on the bay" of Puerto Vallarta is just a 30 min cab ride away. There are too many activities to mention, but we loved the sunset cruise and our whale watching trip. Food, drink, and activities are all inexpensive compared to other resort areas around the world. So, if you are looking for the perfect vacation to take with your family or friends, come to Puerto Vallarta and Villa La Estancia, You will enjoy every minute.! As always, Villa la Estancia delivered!. Melba and Tom helped us rent a fabulous unit on the ground floor with easy access to everything. The accommodations are second to none and we continue to return year after year. We love VLE. The peaceful and quiet property is what draws us back not to mention the good food, fabulous staff and beautifully landscaped and manicured grounds. Thank you Melba and Tom for your help! Always a wonderful experience and relaxing week. Notre région est célèbre pour ses plages kid amicales et atmosphère tranquille. Nous sommes situés sur Bandaras Bay, en profitant des brises fraîches et couchers de soleil parfait. Il ya des petites villes à proximité de restaurants et boutiques. Il est parfait pour une famille ou pour la retraite d'un couple.